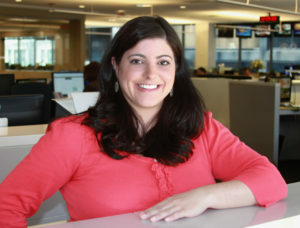 Carly is an Emmy Award winning assignment editor for CBS 2 Chicago. She joined the station in September 2003 from WLS-TV where she worked as a desk assistant and field producer since 2000. Carly is fluent in Spanish, was born in Venezuela and studied abroad in Sevilla, Spain. Carly grew up in the south suburbs and attended Homewood-Flossmoor High School. She graduated with a double major in Broadcast Journalism and Spanish from the University of Wisconsin-Whitewater. I first got involved with NAHJ in 2015. During that time, I was instrumental in organizing and executing WBBM-TV’s involvement with the NAHJ Job Fair. During my term as Vice President of NAHJ Chicago, I chaired both the Job Fair and Scholarship Committees. During the 2016-2017 year, the chapter raised enough money to give four students $6,500 in scholarships. This year, the chapter will be awarding three $2000 scholarships. I personally got to know each of the scholarship recipients and I look forward to continuing the program. This year, I also plan to focus on gaining more chapter members as well as continue to organize events to keep Latinos connected with current future journalists. Diana Gutierrez is a Mexican-American Chicago native. Born to immigrant parents, she is bilingual and speaks fluent Spanish. Diana is one of two news reporters on WCIU’s ‘The Jam’. 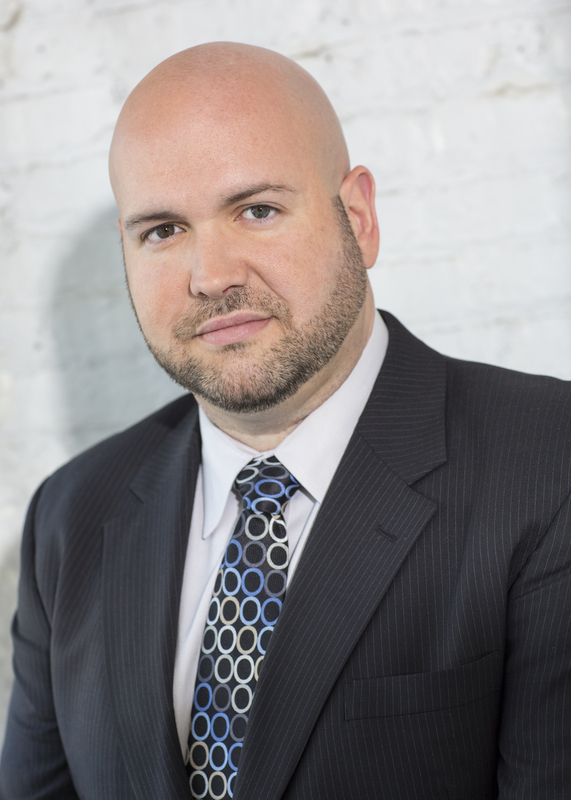 Born on the city’s Southwest side, Gutierrez understands the importance of unbiased journalism and is passionate about storytelling. Gutierrez discovered her passion for journalism while she was studying abroad in Madrid, Spain. Soon after, as a first-generation college graduate, she received her bachelor’s degree from DePaul University in 2016. She kicked off her career in South Bend, Indiana where she was a weekday general assignment reporter and weekend morning anchor. She’s covering everything from immigration reform, severe weather, and festivals. NAHJ-Chicago Chapter has helped develop my character as a journalist. Surrounded by Latinx peers who work to tell the unbiased truth, encouraged me to work harder and do better. Because of this impact, I decided to start a Latinx journalism organization on DePaul University’s campus, since we didn’t have something of the like. The organization has had such a positive impact on campus and that made me realize I wanted to hold a board position on NAHJ-Chicago. As Vice President, I hope to not only serve as an asset for those who are aspiring journalists, but also uphold the vision of having more Latinos in news. My goal for the coming months is to ensure everyone has an equal opportunity to access the resources NAHJ has to offer in order to be successful. Will is currently the Executive Director at Focus on Tomorrow, an education nonprofit that teaches high school student the fundamentals of journalism. Working mostly with at-risk youth in Chicago, Will seeks to expose teens to opportunity and expose their creativity. My goal with NAHJ is to provide aspiring journalists with as many opportunities to reach their dreams. This includes raising funds for scholarships, creating networking opportunities, etc. 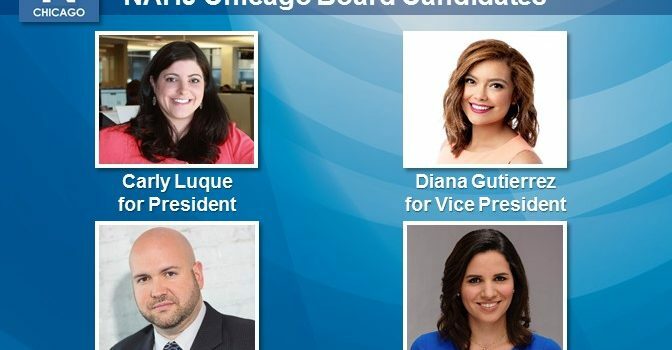 Over the last two years I have served as Secretary and then Treasurer of NAHJ Chicago and hope to continue serving the Hispanic population of Chicago. Sandra Torres is a bilingual journalist with more than 10 years of experience in the TV News Industry. She’s currently working as a Morning and Midday Reporter at NBC 5 Chicago and Telemundo Chicago. Previously, Sandra worked as a General Assignment Reporter for CBS 2 Chicago from 2015 to 2017. She has experience behind the scenes and in front of the camera in Milwaukee and Chicago. 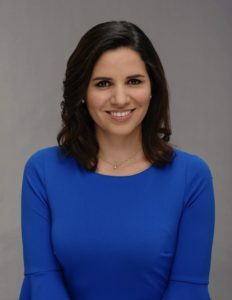 Sandra began her career in Broadcast Journalism in 2006, after graduating from Illinois State University with a bachelor’s degree in Mass Communication and a minor in Spanish. Sandra was born and raised in Cali, Colombia, but moved to Chicago’s Northwest suburbs with her family when she was a teenager. She’s a graduate of Buffalo Grove High School. Since I moved back to Chicago in 2015, I’ve made it a priority to become more involved with Chicago’s NAHJ chapter. Whether it’s promoting NAHJ events or helping organize the “Nuevo Comienzo” fundraiser, I’ve taken steps to support the group in any way I can. I truly believe NAHJ provides important resources to all Hispanic Journalists, like myself. It is that admiration for NAHJ Chicago that motivates me to take on the role of Secretary. My goal is to not only help the organization grow by recruiting more members, but to motivate them to be involved as well. It’s a challenge I’m ready to take!